Love the location, it’s next to the busy streets but you also have the peace and quiet. The staff at the front desk are very nice and helpful. Breakfast choices were good. The location is great to see many interesting on the around Kao San road. Perfect location in the heart of Bangkok!! The restaurant is fantastic, offering a nice mix of both thai and western foods. The location couldn't be better. Near to Khao San Road but not as noisy. Really nice ambience on the village. The breakfast was great and loved to have a safe box in the room. The swimming pool is heaven! Overall I am very happy and would like to go back. Either solo travellers, couples or families will be more than just fine. The location is the best. The Khoason road area is great for shopping, massage abdominal food. Try Mangos and Joy Luck Club restaurants of you are vegan. They have other food and they are both great. Darin Spa is a winner! The location is amazing! You can do everything by foot (kao San road and some temples). There are lots of good restaurants around the hotel so is very easy. The property is okay and with because of the facility of the location. And the breakfast is simples but good also. We have stayed here several times and love coming back. Not much. This is a giant motel, with rude and unfriendly staff. The rooms are old, noisy, and not comfortable. Good breakfast, good aircon, decent bed, nice pool. Rambuttri Village Plaza This rating is a reflection of how the property compares to the industry standard when it comes to price, facilities and services available. It's based on a self-evaluation by the property. Use this rating to help choose your stay! 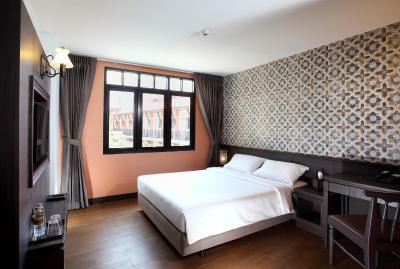 One of our top picks in Bangkok.Surrounded by culture and activity, Rambuttri Village Plaza is located in Bangkok’s historic Rattanakosin District, a 5-minute walk from Khaosan Road. It has 2 rooftop pools. Rambuttri Village Plaza is 23 mi from Suvarnabhumi Airport. 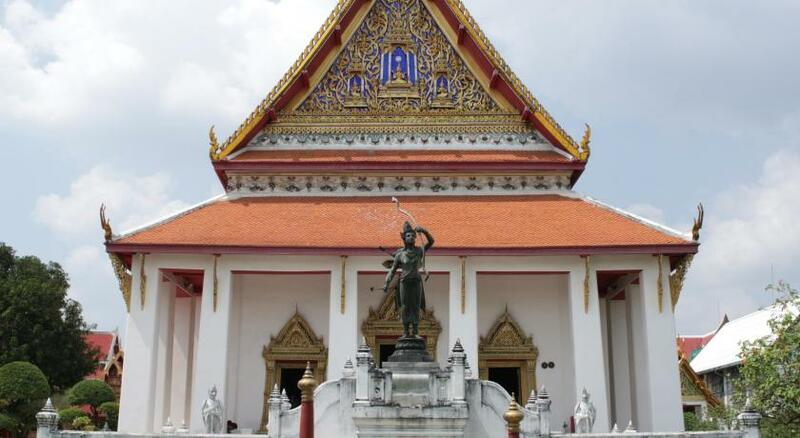 The famous temples of Wat Phra Kaew and Wat Pho, as well as The Emerald Buddha, are a short stroll from the hotel. 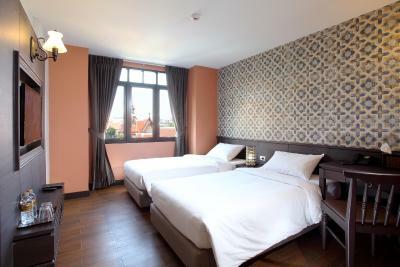 Comfortable and cozy, rooms at Rambuttri are fully air conditioned and come with hot shower facilities. Each has a cable/satellite TV and personal safe. The hotel’s beauty salon features traditional Thai massage as well as other beauty treatments. Guests may make use of the on-site travel agency to plan day trips. Rambuttri also has a pharmacy, souvenir shop and 24-hour convenient store. Rambuttri Terrace serves selections of Thai and European cuisine, as well as a wide range of fine beverage. 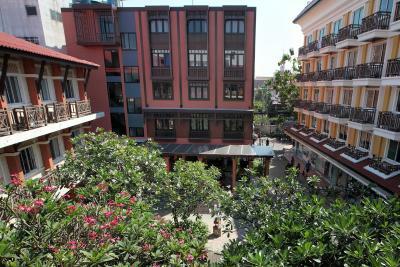 When would you like to stay at Rambuttri Village Plaza? This air-conditioned room features cable TV, a personal safe and a desk. Free toiletries, a hairdryer and a hot shower are included in the private bathroom. Air-conditioned room features a cable TV, a personal safe and a desk. Free toiletries, a hairdryer and hot shower facilities are included in an private bathroom. Please note that the room is located on a higher floor and can only be accessible by stairs. Air-conditioned room features a 32-inch cable LCD TV, a DVD player and a fridge. A personal safe and a desk are provided. Free toiletries, a hairdryer and hot shower facilities are included in a private bathroom. Air conditioned room features a 32-inch cable LCD TV, a DVD player and a fridge. A personal safe and desk are provided. Free toiletries, a hairdryer and hot shower facilities are included in a private bathroom. Air-conditioned room features a 40-inch cable LCD TV, a DVD player and a fridge. A personal safe, a desk and seating area are provided. Free toiletries, a hairdryer and hot shower facilities are included in an private bathroom. Air conditioned room features a DVD player, a fridge and a personal safe. They come with cable TV. Free toiletries, a hairdryer and hot shower facilities are included in a private bathroom. Please note that this room type can only accommodate 1 guest. Air-conditioned room features a 32-inch cable LCD TV, DVD player and a personal safe. A fridge, kettle and a desk are also provided. Free toiletries, hairdryer and hot shower facilities are included in a private bathroom. Air-conditioned room features a cable TV, a personal safe and a desk. Free toiletries and hot shower facilities are included in an private bathroom. Air-conditioned room features a cable TV, a safety deposit box and a desk. The private bathroom comes with free toiletries and hot shower facilities. Rambuttri Village Inn offers clean and comfortable accommodations that go easy on your budget, featuring air-conditioned room with hot /cold shower & cable TV. All rooms have windows and private bathrooms. House Rules Rambuttri Village Plaza takes special requests – add in the next step! Rambuttri Village Plaza accepts these cards and reserves the right to temporarily hold an amount prior to arrival. Credit card will be used for guarantee purposes only (except for nonrefundable booking). When settling the bill, the property will accept credit card (only Visa or Mastercard) or cash in Thai Baht only. The full amount of the reservation must be paid when checking in. Guests are also required to place a refundable deposit of THB 1000 via cash in only the Thai Baht (THB) currency during check-in. Guests who check out after 12.00 noon will be charged 50% of the room rate. 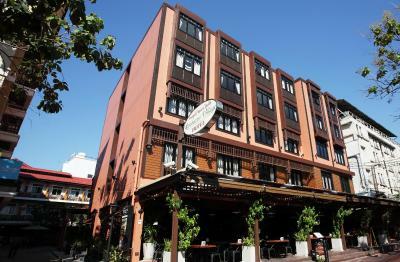 Guests who check out after 16.00 will be charged one night's room rate. Please note that the name of the credit card holder must be the same as the guests name and credit card must be presented to the property upon check-in. Great hotel, well priced in excellent location. Will book again when next in Bangkok. Bathroom was OK, but the shower was really bad. Reception personell was mediocre. Sheets were washed but obviously overused and with a lot of stains. Good localisation in the middle of soi rambuttri. Breakfast was good. What was really helpful was the bag deposit - they keep your bag for 20 Baht. Very unconfortable rooms. The pillows and matress are bad, the bathroom and towels very old and the a/c system is too noisy to have it on during the night. I would not recommend it. They are very kind. Location is very good nearby Khaosan. Most of all, Air condition is very nice working. And also breakfast is good. Pool was a bit dirty. Our room wasn’t cleaned once during our stay. No view from the room. The wifi was inconsistent, the room felt dark and dingy and the decor is very dated. The rooftop pool is the best feature of the hotel! The cleaning staff were also sweet and attentive. For a cheaper shorter more realistic temple experience go to the Wat just round the corner from the hotel - loved it. Great massage nearby. Great northern Thai restaurant - turn right out of hotel and follow road right round the corner for 500 yds - its on the right hand side. There was a weird smell in our room when we first got in there but after blasting the air on for a while it went away. Room was ready on arrivals so paid a little extra for early check in which was welcomed! Staff were nice considering they were extremely busy checking in other guests. Walls and doors not soundproof. You hear everything from next room and hallway. Nice staff. Eazy check in. Basic but clean rooms. I traveled alone and stayed in a singel room, wich is perfectly fine, but If you travel as a couple, or 2 friends, book superior Deluxe in the new departement of the hotel, much nicer rooms. Pool on rooftop, actually 2 pools excellent for chilling of and get away from all the Streetbuz. 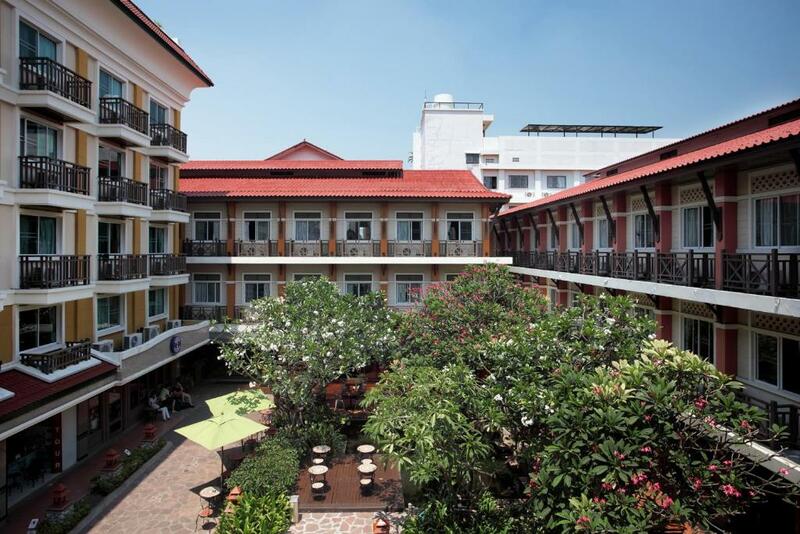 Budget hotel, but perfect location on very nice Street, with lots of restaurants and bars, close to Kao Sarn Road, buy a lot cozier. I always stay here when in Bangkok.